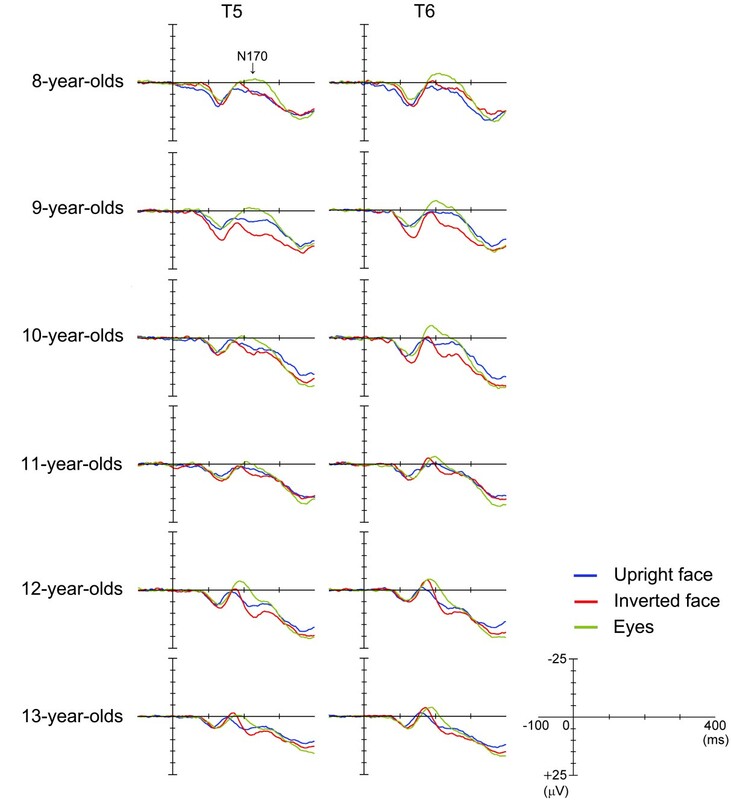 Figure 2 shows the grand-averaged waveforms obtained with the upright face stimuli by the T6 electrode (right hemisphere) in each age group (8-13-year-olds). The N170 signals observed after the presentation of the upright face stimuli were longer in duration and/or had at least two peaks in the 8-11-year-old children, whereas those seen in the 12-13-year-old children were sharp and only had a single peak. Figure 3 shows the grand-averaged waveforms recorded for the 8- to 13-year-old children in each stimulus condition (upright face, inverted face, or eyes) by the T5 (left hemisphere) and T6 (right hemisphere) electrodes. N170 latency was significantly longer after the presentation of the eyes stimuli than after the presentation of the upright face stimuli in the 10- and 12-year-old children. In addition, significant differences in N170 latency were observed among all three stimulus types in the 13-year-old children. N170 amplitude was significantly greater after the presentation of the eyes stimuli than after the presentation of the upright face stimuli in the 8-10- and 12-year-old children. The results of the present study indicate that the upright face stimuli were processed using holistic and/or configural processing by the 13-year-old children. (1) Upright face: images of a neutral face; (2) Inverted face: inverted versions of the upright face stimuli; (3) Eyes: images showings eyes alone without facial contours or other features. N170 was a large negative deflection between 150-250 ms for all ages in this figure. The large negative deflection (N170) was longer in duration and/or had at least two peaks in the 8-11-year-old children, whereas it was sharp and had one peak in the 12-13-year-old children. The black arrows indicate the abovementioned peaks.